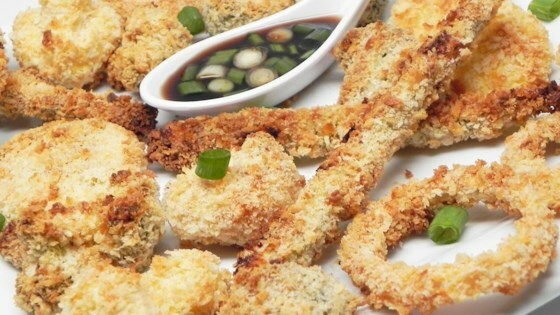 "This appetizer is a super easy and delicious way to start any Asian-inspired meal. Enjoy!" Preheat oven to 450 degrees F (230 degrees C). Grease a large baking sheet. Combine panko and salt together in a shallow bowl. Whisk eggs in a separate small bowl. Combine broccoli, cauliflower, sweet potato, winter squash, onion, and green beans together in a large bowl; add flour and toss to coat evenly. Shake excess flour from each vegetable piece, dip into beaten egg and press into panko mixture. Gently toss between your hands so any panko crumbs that haven't stuck can fall away. Place vegetables onto prepared baking sheet; do not stack. Bake in the preheated oven until golden brown, turning occasionally, 10 to 15 minutes. Stir soy sauce, water, rice vinegar, and sugar together in a saucepan over medium heat until hot, 1 to 2 minutes. Remove from heat and add green onion. Serve sauce alongside vegetables. You can experiment with any vegetables you like. It's also a great way to use up any leftover vegetables.